Another week has come and gone at Doc’s Sports, so before we get caught up in Week 11 of NFL football, let’s take the time and go over this week’s basic strategy teaser betting lines. Remember, we are specifically looking for lines that feature 7.5-point to 8.5-point favorites and 1.5-point to 2.5-point underdogs. If you need to brush up on your basic strategy teaser knowledge, check out the Doc’s Sports archives for more in-depth articles. Note: the teasers are presented in descending order from the ones that have the most value to the ones with the least. The Miami Dolphins are still in the AFC wild card race, so this week’s matchup against the free-falling Buffalo Bills is a must-win for the team if it wants to keep its playoff hopes alive. The Dolphins are 4-5 and two games behind the Pittsburgh Steelers for the final wild card spot — and with Ben Roethlisberger injured, this week is the perfect time to make up some ground. The Bills have lost five of their last six games — four of them by double-digit margins — and seem completely lost at this stage of the season. This is Miami’s game to lose, and the gambling stats seem to back it up. 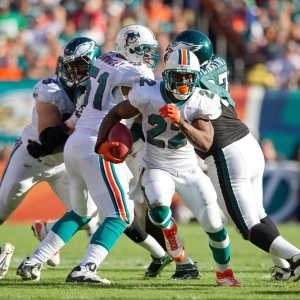 The Dolphins are 3-2 ATS on the road and 4-2 ATS as an underdog. The Bills, on the other hand, only have a 4-5 ATS record and a 1-2 ATS home record. Miami desperately needs to win this game, so at the very least should manage to keep it close. Getting them plus 7.5 points is a really good spot to be in. If this were any other team, you would expect the San Diego Chargers to be hyped up and ready to avenge their embarrassing Week 6 “Monday Night Football” loss to the Denver Broncos. But, unfortunately, the Chargers will not be able to do anything about it. San Diego is 2-5 over their last seven games, with their only two wins coming at the expense of the Kansas City Chiefs—yes, the 1-8 Kansas City Chiefs. San Diego has also struggled to cover the spread, as they are 2-3 against the spread on the road and are 1-2 ATS as an underdog. The Broncos, on the other hand, are continuing to chug along under MVP candidate and one of the greatest regular season quarterbacks of all-time, Peyton Manning. The team has won four games in a row by an average of 18 points and is well on its way to and 11- or 12-win season, which has been standard for a Manning team over the last 10 years. Denver is 3-1 against the spread at home and 5-0 as an ATS favorite. The Broncos will probably cover the original eight-point spread, so teasing them down to a two-point favorite just ensures more breathing room, just in case the Chargers come in more motivated than usual. This week’s matchup is a deceptive one at first glance. The Tampa Bay Buccaneers are 5-4 and on a three-game winning streak, while the 2-7 Carolina Panthers have lost six of their last seven games and seem to have serious team chemistry issues — this should be an easy cover for the surging Buccaneers, right? As a sports bettor, you would think so, but not necessarily. With the exception of two games, Carolina has been competitive all season, and they had the ball in the fourth quarter with a chance to win the game against the Bears, Cowboys, Seahawks and Falcons. Sure, almost winning doesn’t count, but the point is the Panthers are not as bad as they seem on paper. Not counting their two blowout losses to the Denver Broncos and New York Giants, Carolina has been outscored by their opponents by only 18 points in six games. Expect the Panthers to keep the game close and probably have the ball late in the game with a chance to win. The extra six points will come in handy during the game, as Carolina is probably going to lose a close game. It’s difficult to predict what the Dallas Cowboys will be doing on a week-to-week basis. If there is any team in the NFL that crumbles under expectations more than the San Diego Chargers and Philadelphia Eagles, it’s the Dallas Cowboys. The team is in a must-win situation if they want to keep their slim playoff hopes alive. But would anyone be surprised if the Cowboys lost a very winnable game against the 2-7 Cleveland Browns? Dallas should win this game—their four wins have come by an average of eight points. So, while they might not cover the original spread, teasing them down to a 1.5-point favorite is an excellent spot to have on paper. I do not want to overthink this one too much and throw out alarming stats that say Cowboys are 0-3 against the spread at home and are 2-3 as an ATS favorite — but if you were looking to pass on a game, this one would be it. Taking the Cowboys as a 1.5-point favorite is great in theory, but if any of the four basic strategy teasers were to lose, it would be this one. This week’s basic strategy teaser games are four solid wagers to have. The Dallas Cowboys teaser is the most concerning of them all, but that’s only because we, as fans, are so used to watching them fail in games that feel like they should be cake-walks. This season’s basic strategy teaser wagers have been returning a 50 percent profit for bettors, so now would be the time to try and catch some of the value. Remember, bet wisely and may the spread be with you.